Candelabra trees are found near the equator and in the East Indies and Africa. They live in the savanna biome. 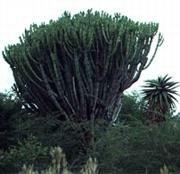 The candelabra tree can grow up to 30 to 40 feet (10 m) tall. The branches all grow from one trunk, and look like little cactuses that grow near the top, giving it the shape of a candelabra. It has little yellow flowers in mid-winter. The candelabra tree is beautiful, but poisonous. If a drop of the white sap from the inner tree comes in contact with the skin a blister will form. It will blind you if it touches the eyes and even breathing the fumes burns. This sticky poisonous latex along with its sharp spines makes it so animals don't feed on it. The candelabra tree is sometimes used as a living fence probably because it has sharp spines on its branches, and touching it burns. "Sixty Indigenous Trees of Guateng", http://www.websightdyn.co.za/treehouse/euphorb.html, (june 4, 2000).